Hello out there in doodlebug land! 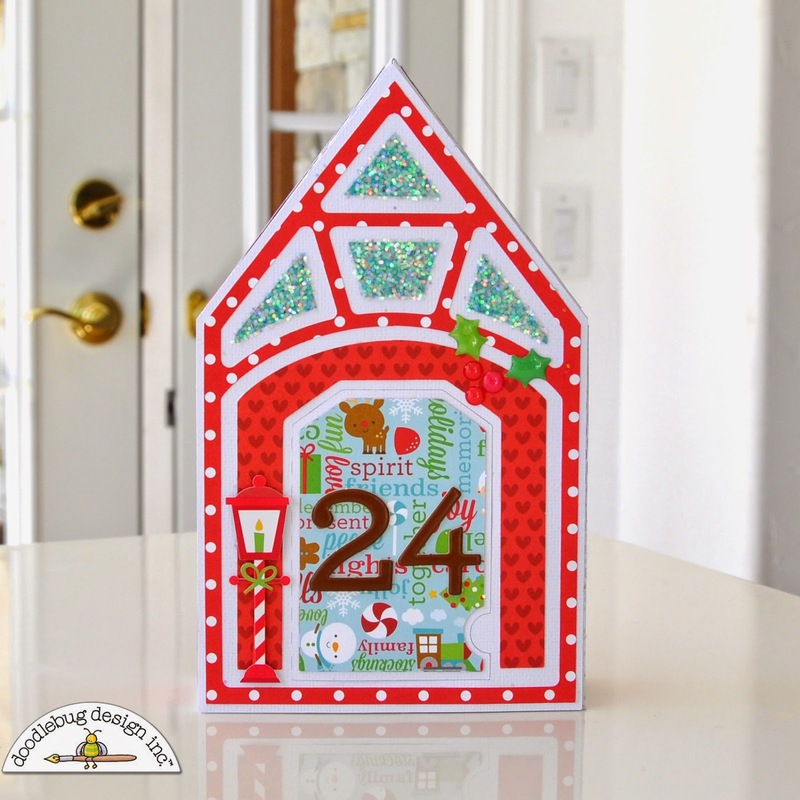 Courtney Lee from Court's Crafts here with a 3-d advent calendar! 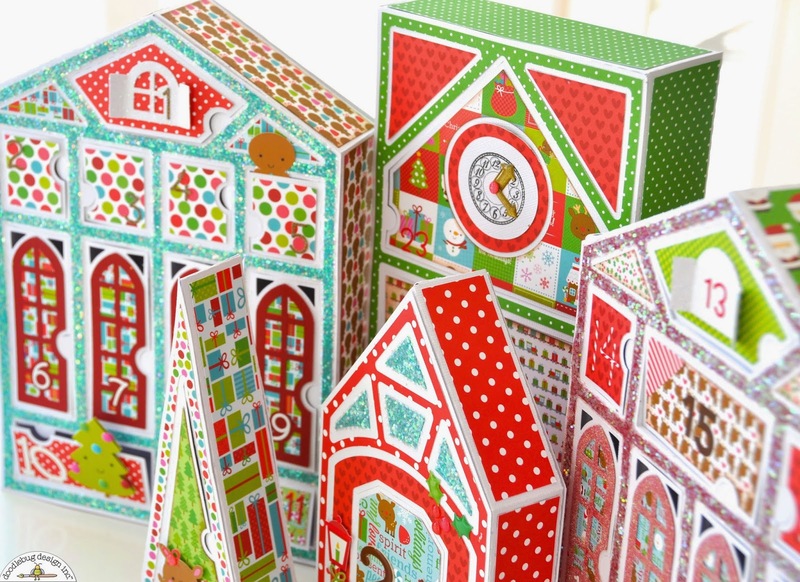 I have a thing for advent calendars. My parents worked their bums off and most of the time my advent calendar was the highlight of my year (presents-wise). Sometimes I had a piece of See's Candy in a box and other times I had bobby pins or rubber bands. My dad even would put comics in a few of the boxes. Sometimes there would be a pair of earrings or a small necklace in the 25 box! I loved it and I want to bring that magic to our kids as well! 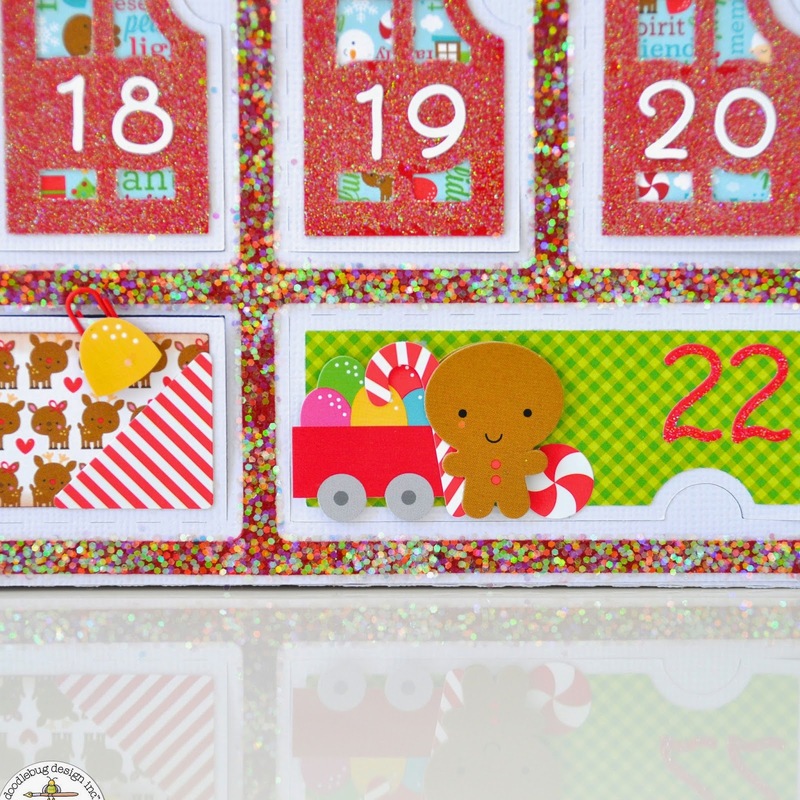 When I saw Santa Express I knew that I wanted to use this collection to make an advent calendar that would last me years and years. So without holding back, I dove in! 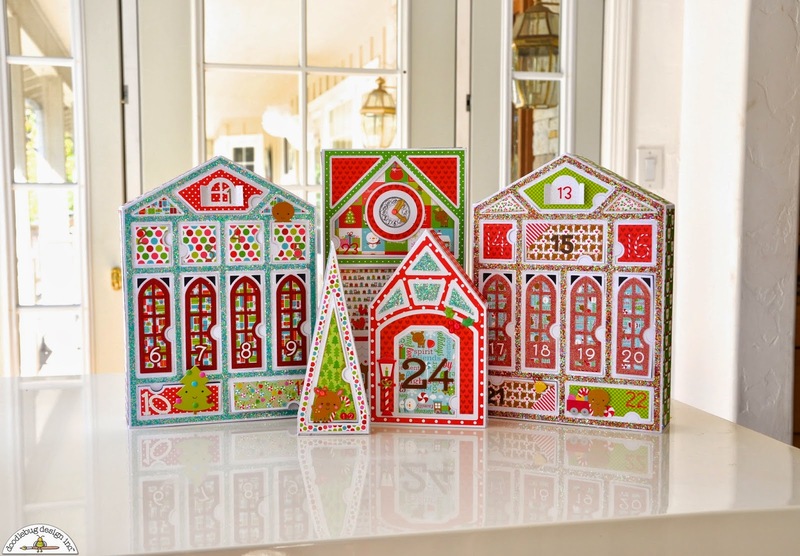 As pictured above, the advent calendar is made up of 5 "houses". This is the first. It holds the first 11 boxes and stands 12 inches tall. The papers are a mix of 12x12 and the 6x6 pad. The solids are also doodlebug! They just released a whole solids line to match their cardstock! LOVE it! 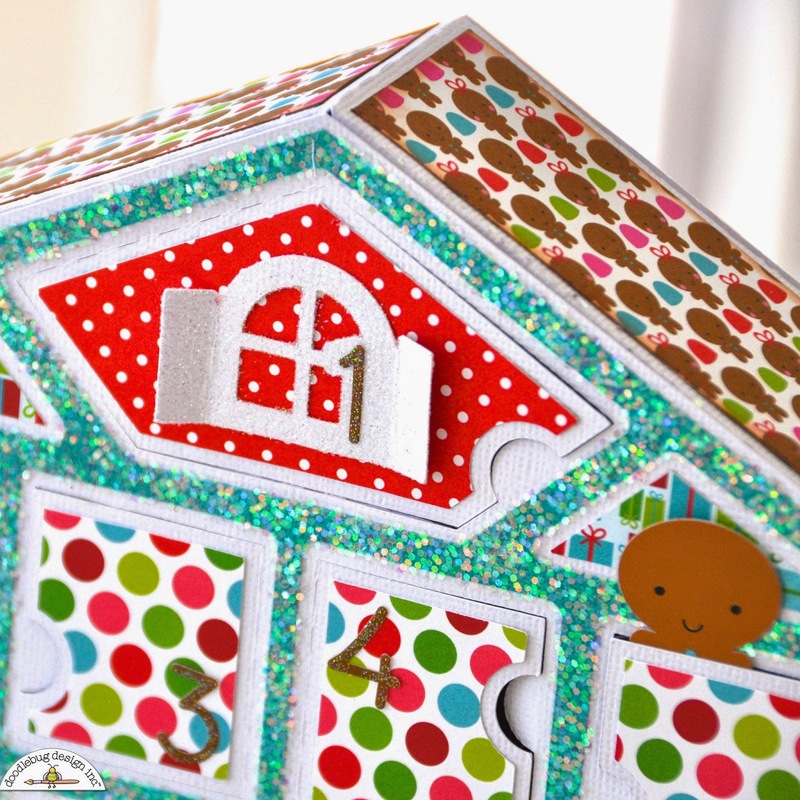 The whole first house was inspired by "gumdrops". 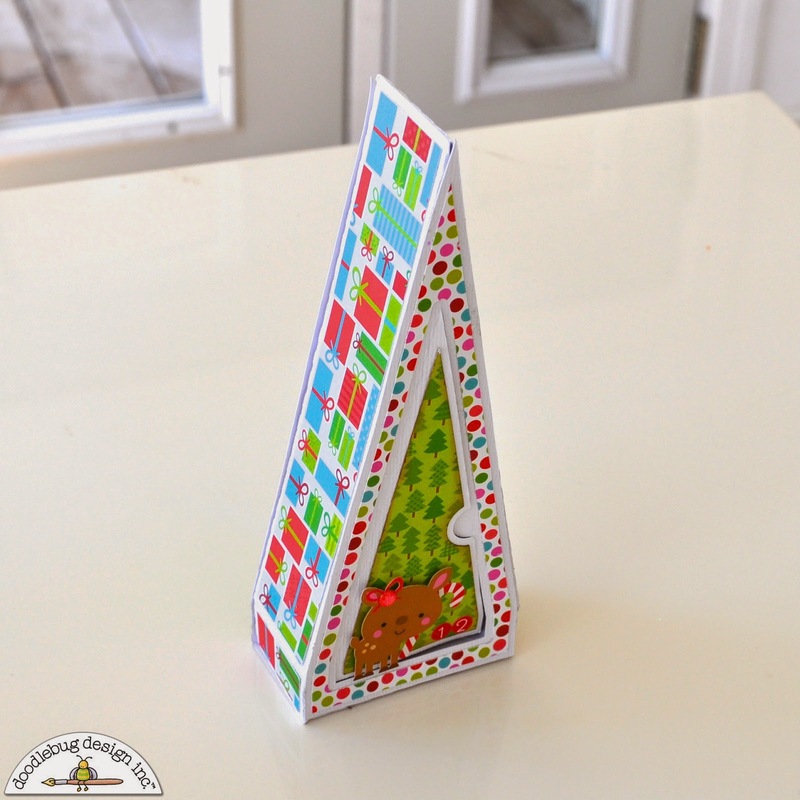 I loved this ginger babies paper! 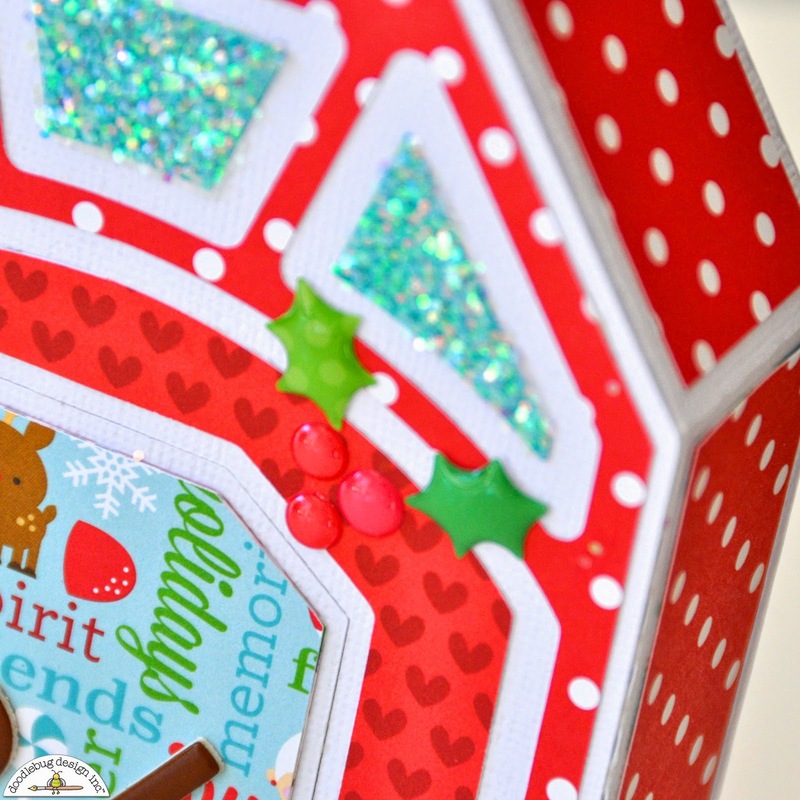 I used doodlebug chunky sugar coating over the top of my solid to give it a glistening look. I also ran the little white shutters through my Xyron and covered them with the regular sugar coating that doodlebug makes. And... they already make glittered alpha/numbers so I used a bunch of those all over my project. So.. here is a funny story... 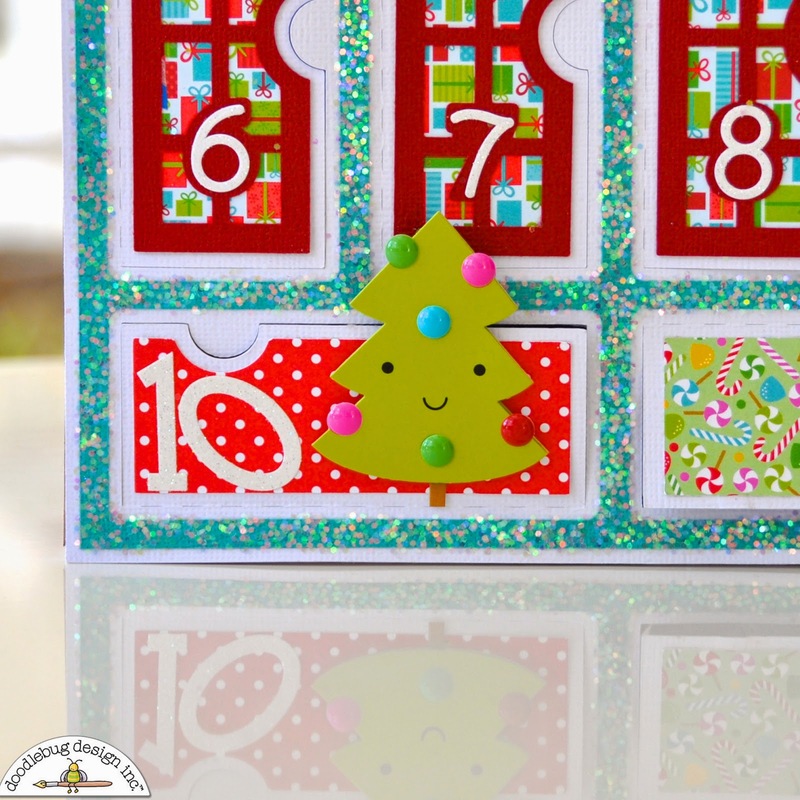 I didn't want to cut out all the little numbers... and doodlebug had glittered alphas. So I just made the cuts and held up my candy shoppe doodlebug alphas - and they fit!! PERFECTLY! Check it out! :) And isn't that tree doodle-pop darling?! Those sprinkles on his front are so much more scrumptious in real life! Well HELLO there gingerbread man!!!! I wanted one peeking out from behind a door because I thought my girls would think that was funny. So I put baby powder on the back to de-stickify my little man (thanks to Wendy Sue-Anderson for that tip!) and then adhesive on his front bottom of his body and stuck him to the door. It's SO weird to put adhesive on the front! It feels like you are doing something wrong! Just showing you how big the boxes are. They are really sizable! Those bottom boxes (10 and 11) can easily hold little race cars. Here comes box 12. I loved that little girl reindeer and who doesn't love candy canes!? I finished it off with some teensy type alphas in ladybug for the numbers. 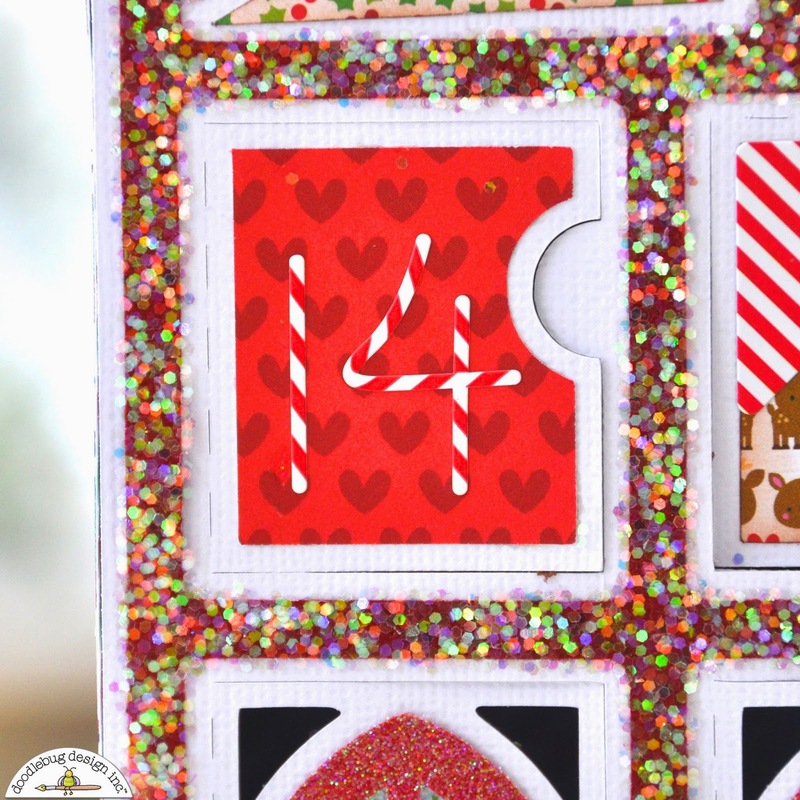 The peppermint striped corner sticker is from the santa express this and that stickers. 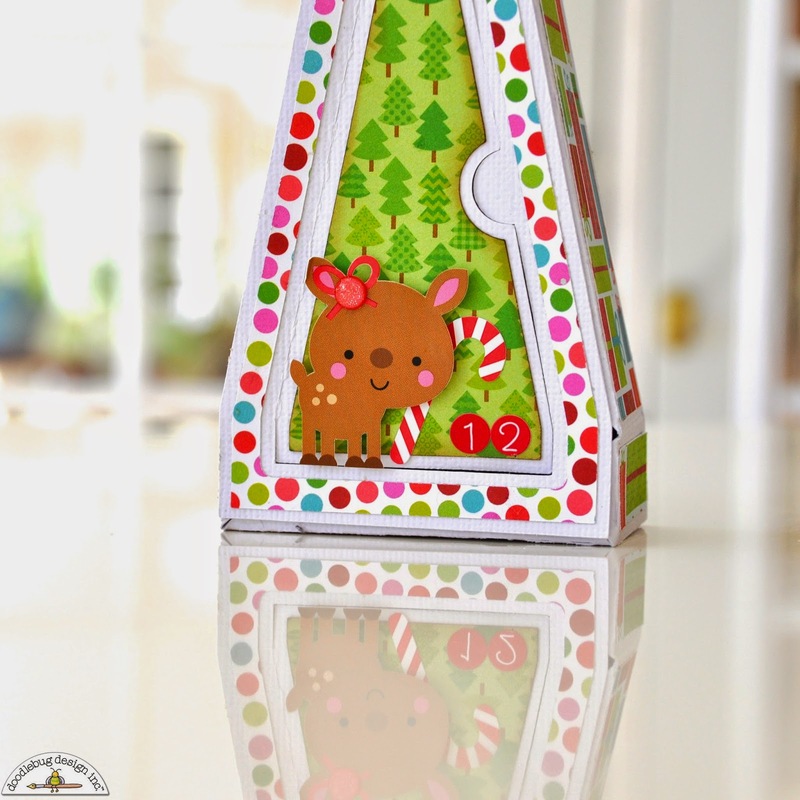 I had to get that cute santa paper in there somewhere! 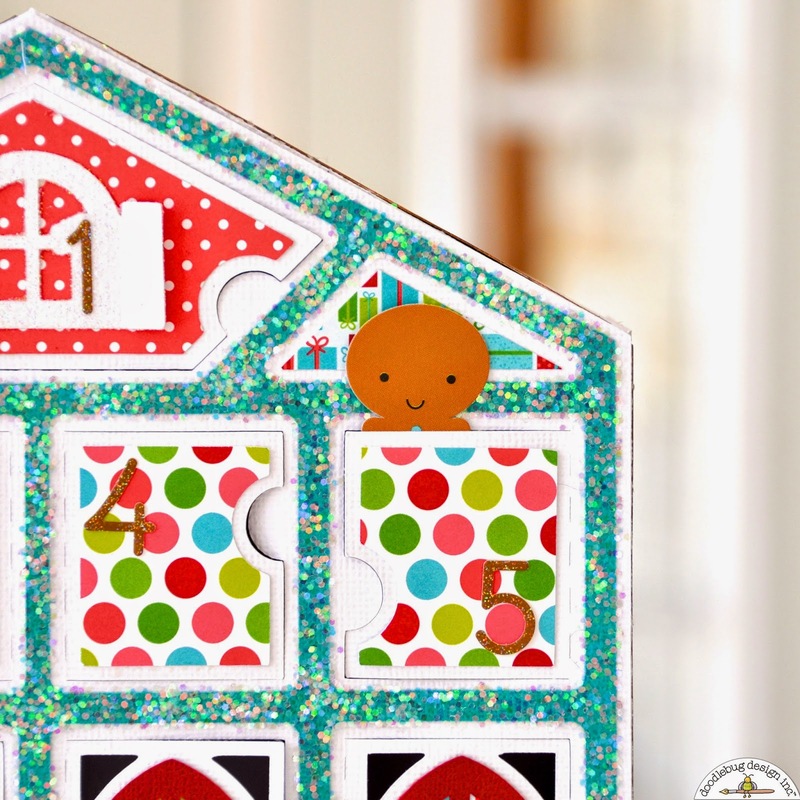 But the boy and girl reindeer paper on door 15 and 21 is probably my favorite. I just had to incorporate this lamppost from the icons somewhere. I loved it from the first! I wanted a bold number on this box so I whipped out my bon bon chippers and voila! Did you all see these holly berries sprinkles shapes!?! LOVE them!!! hoarding them. Polka dots. On the leaves. Oh my goodness. 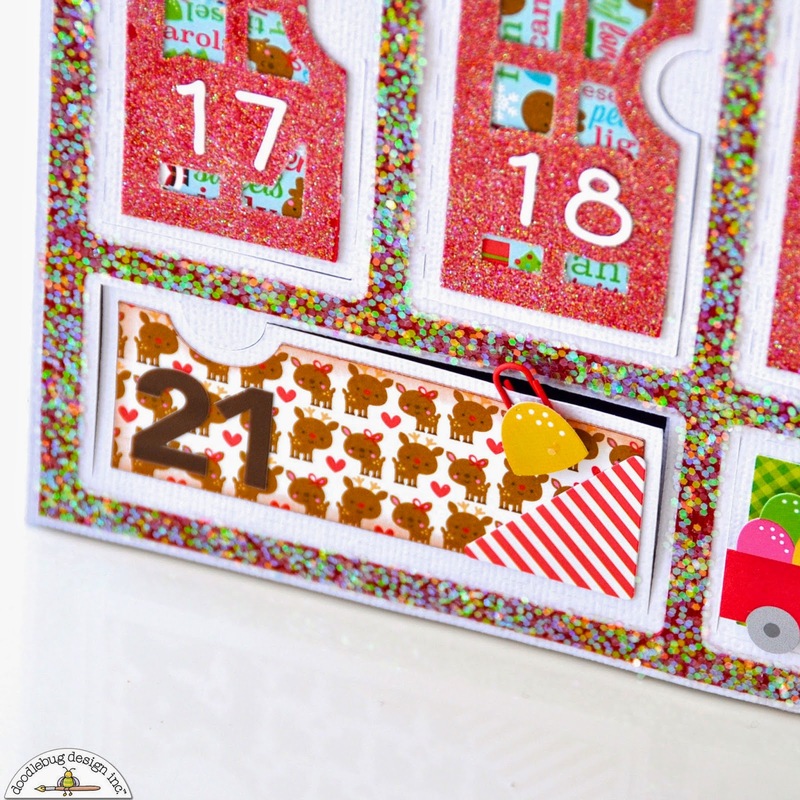 The cut came with a clock, but I liked the idea of stamping my own on there and using the big sugared sprinkle shaped arrows that doodlebug makes to emphasize that it was after midnight and Santa might come at any time! This little scene was the first that I did. 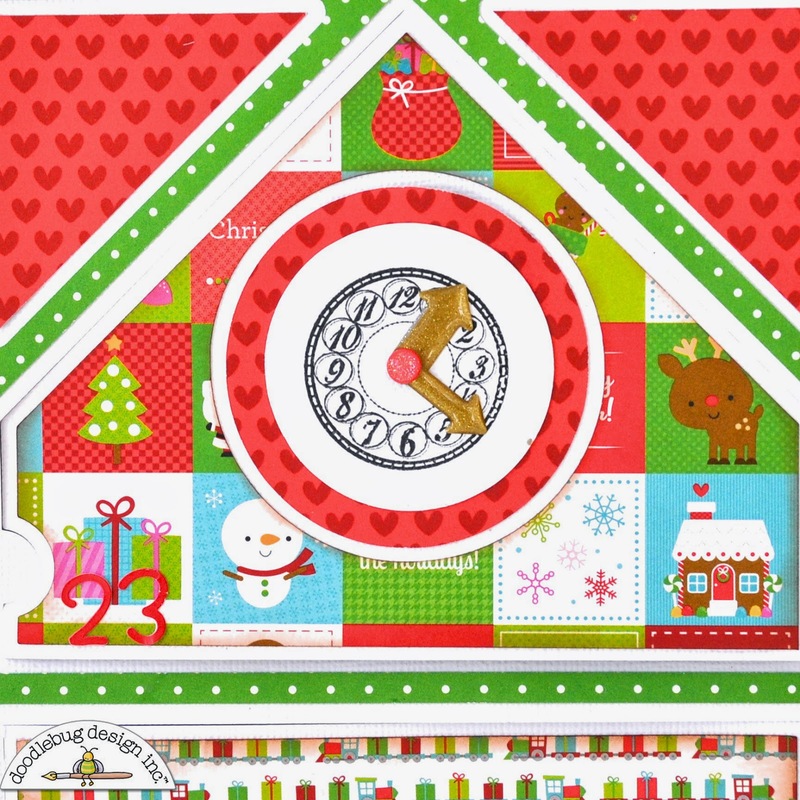 I just HAD to use Mrs. Claus and that gingerbread house on the icon stickers sheet! 6 stickers make up this little scene and I left just enough room to finish it off with the ladybug chippers to emphasize Christmas day! The 25 box is huge! Here it is with some of Emmaline's musical instruments! Well, if you have hung out with me this long, THANK YOU! If you have ANY questions about the project, I am so happy to answer them! You can email me at CourtsCraftsBlog@gmail.com. I used almost every paper in the collection, 9 different types of alphas, almost all the sticker sheets and a whole bottle of glitter - and I love it. I hope you do too and this inspires you to create something that you will have for years to enjoy and doodlebug just makes it that much more fun! This is so cute Courtney!!! Fabulous job!!! Such amazing projects! 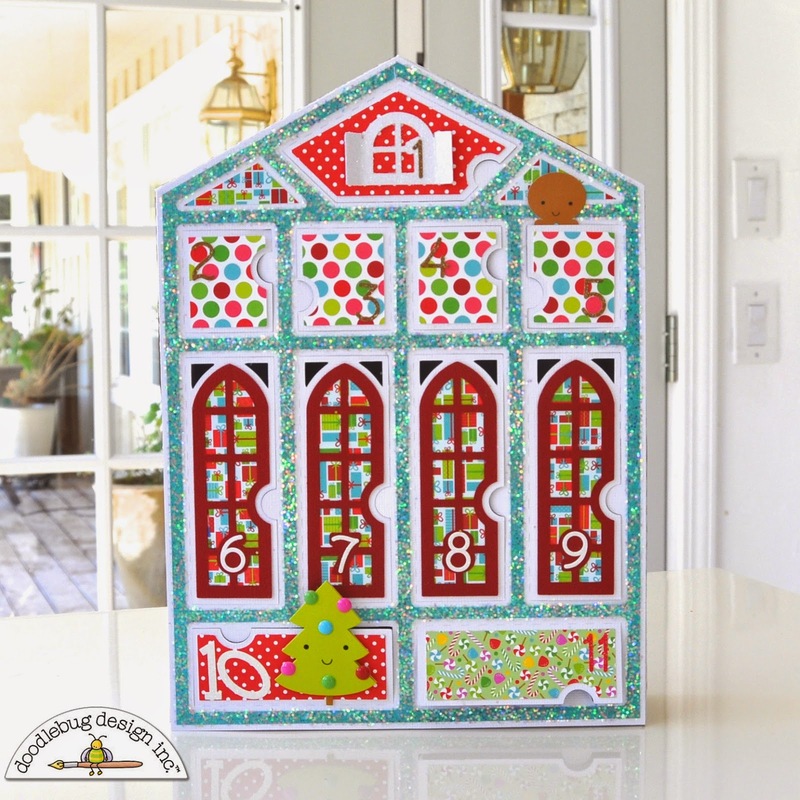 I just love all of the details and embellishments you added! So awesome to hear the release of solid card stock. Must pin this for later! 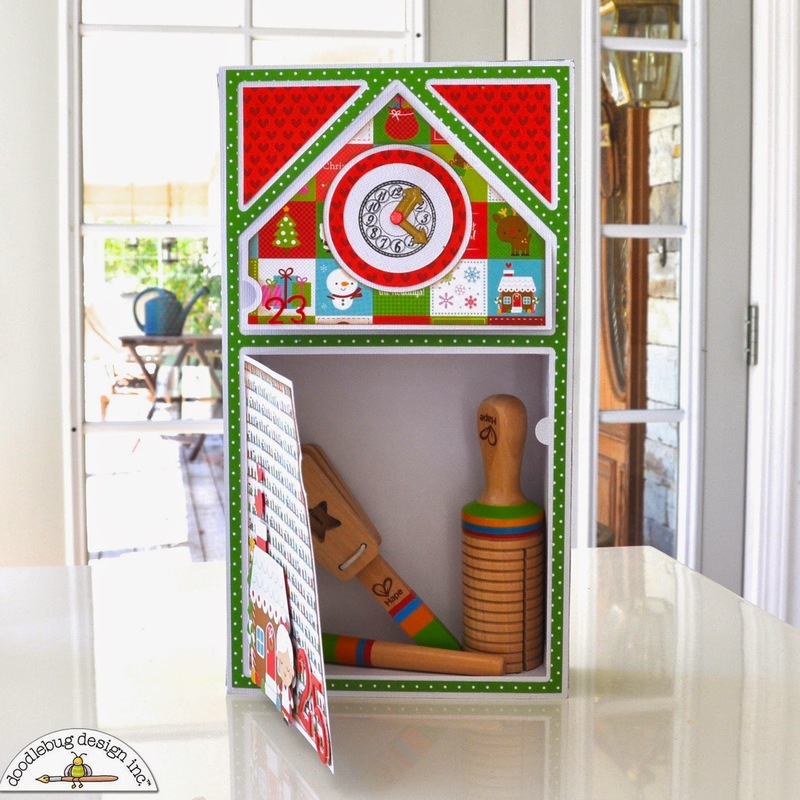 Hermosos me encantaron sus proyectos la felicito!!! So adorable! I pinned the main image (as meredeena). Thanks for sharing! 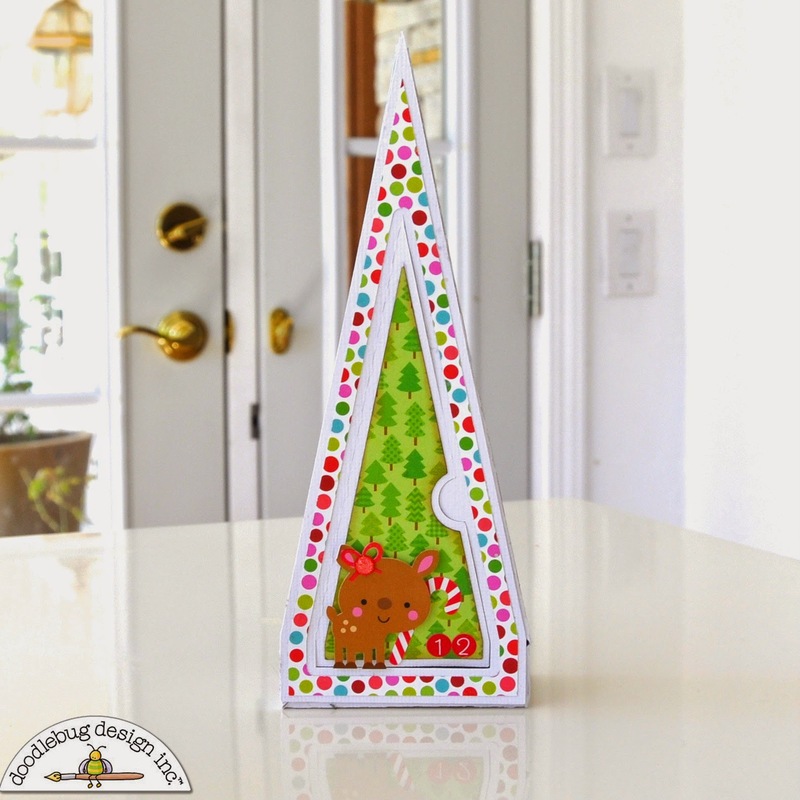 Amazing project...and I love it decorated with the fabulous designs of Doodlebug paper!!! 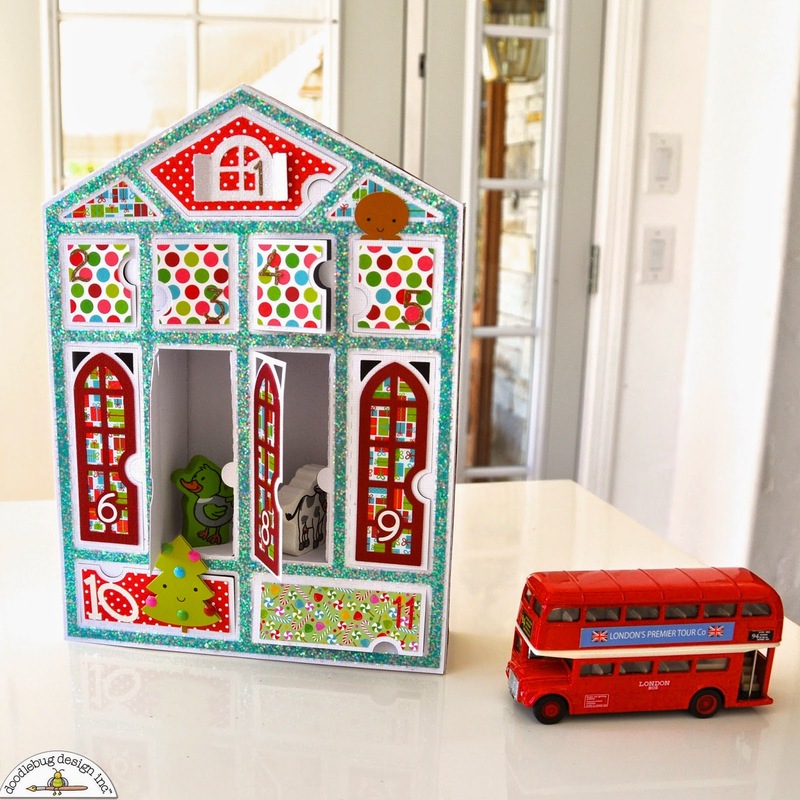 This is the best advent calendar ever!! I'd love to know where you got the houses from!! Here is the link Nina! :) Hope you get this! : Thanks so much for the kind words! They mean SO much to me! Looks like a lot of hard work but definitely worth it! 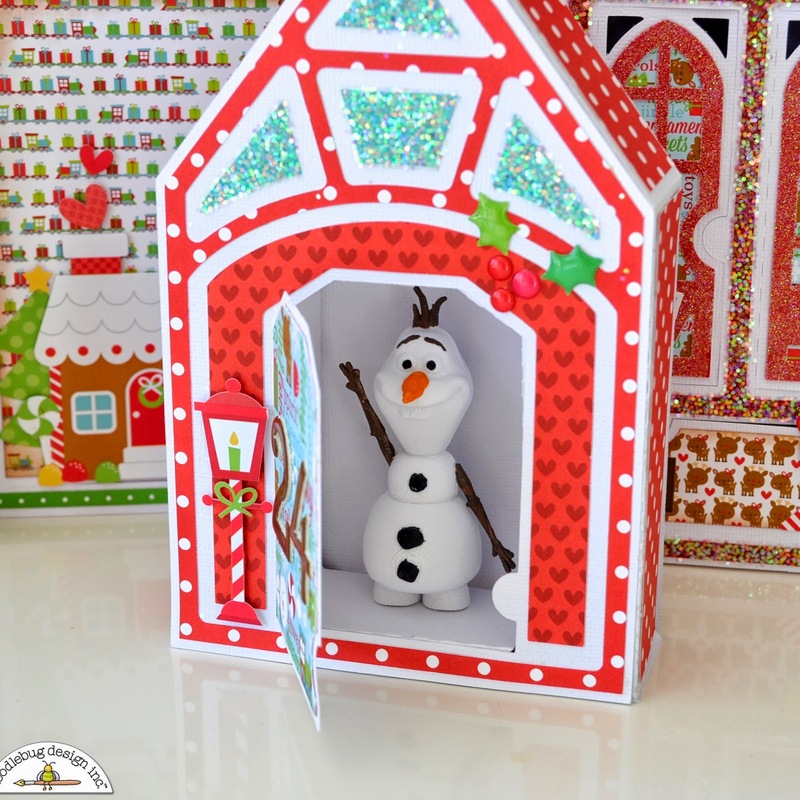 I pinned the house with Olaf. My 2 year old loves Olaf. 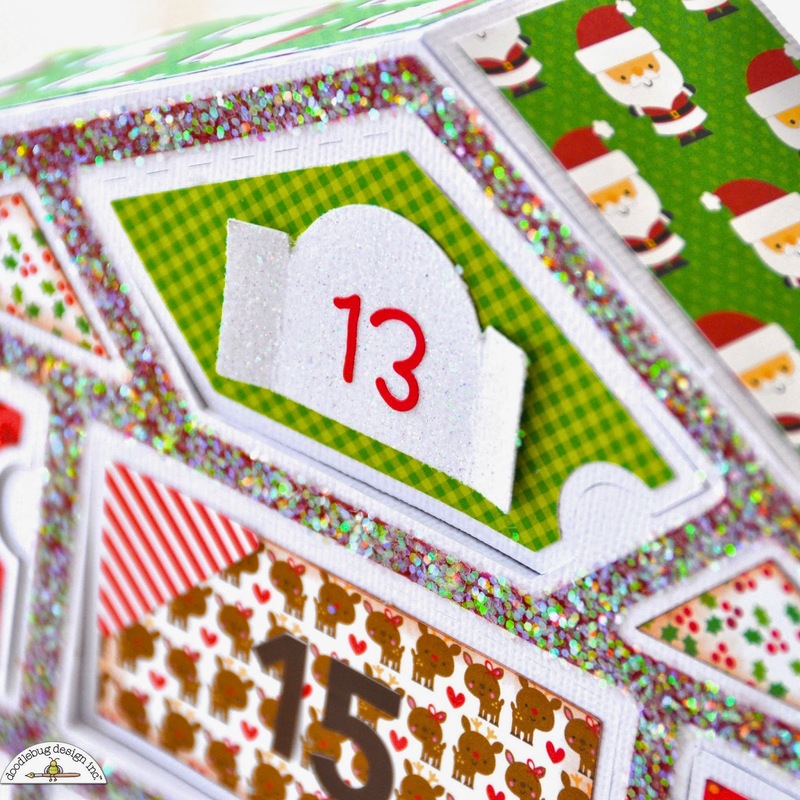 What a fun advent calendar! I love the glitter and bright patterns. That is an amazing project, WOW I cant imagine the amount of work that went into it. 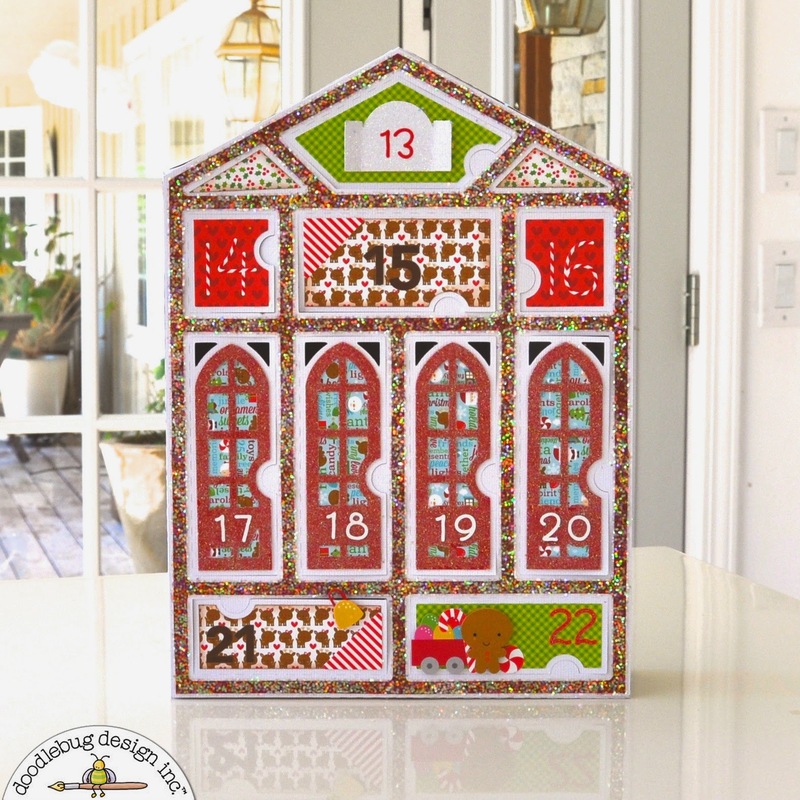 I love advent calendars and this one is so pretty!! Is so very pretty, but i couldn't find where did you get the houses from, could you share that? Thanks! I LOVE this!!!!!!! 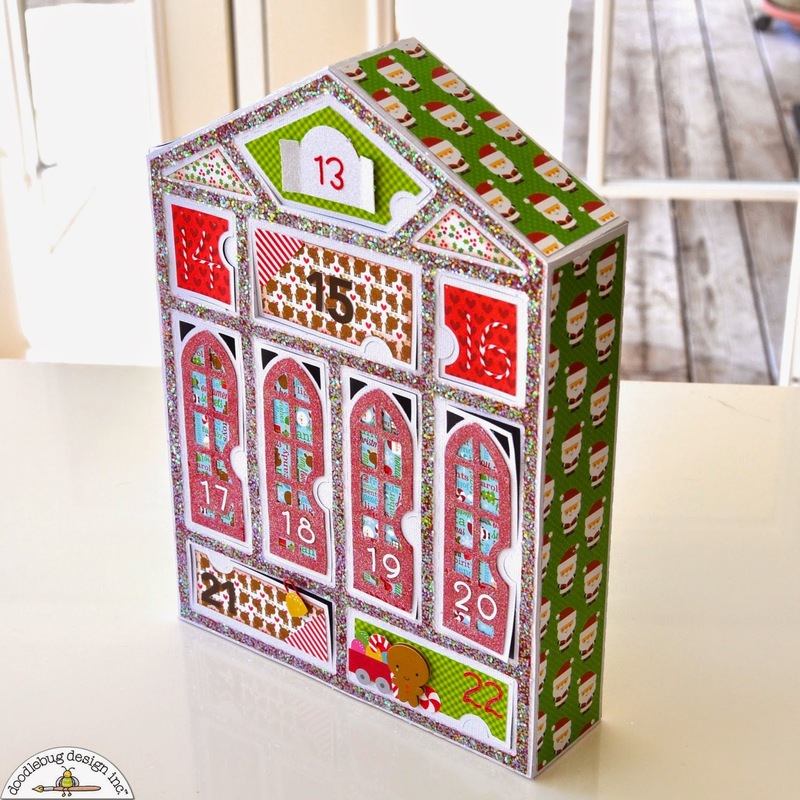 I actually have never made an advent calendar, and even though my girls are teenagers now, I think THIS is the year that they will have one! Court's project and these sweet products have inspired me ... thanks so much!!! I liked and shared this post on Facebook! SERIOUSLY AWESOME, ABSOLUTELY AMAZING advent Courtney - WOW - a piece of art that will surely become a family heirloom!!! I LOVE that your parents made Christmas so special for you and that you are now sharing the MAGIC with your family too - PRECIOUS!!! THANK YOU for sharing your CREATIVE INSPIRATION and your LOVE of advents too :) I confess that I have never made one before but I sure want to now!!! 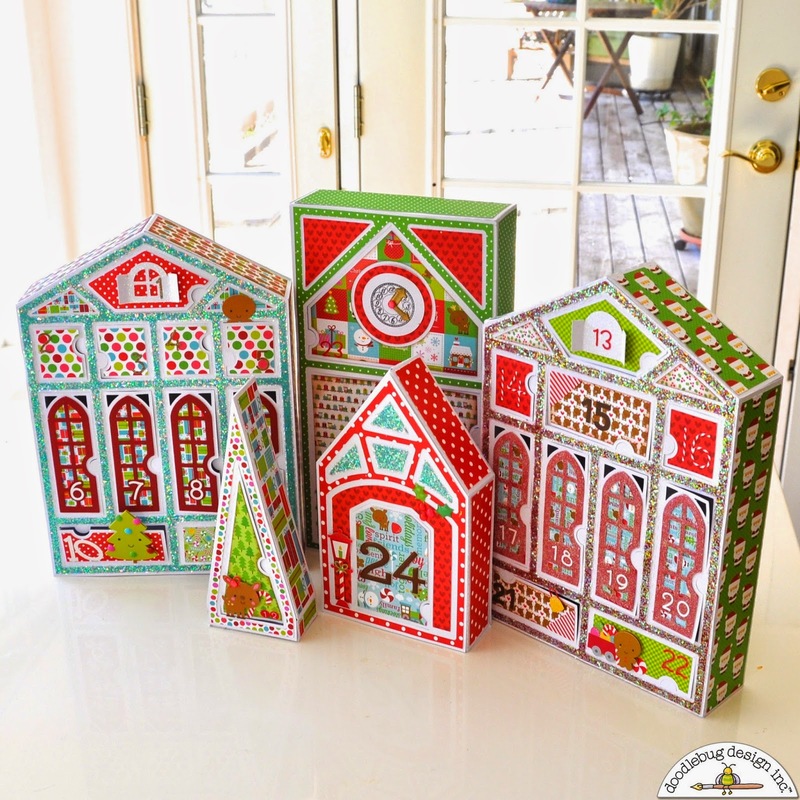 I pinned the 3rd house with boxes 13 to 22 - cuteness galore!!! http://www.pinterest.com/pin/288300813620328422/ pinned here ! So excited for Xmas !!! OH. MY. GOODNESS!!!!! WOW I love these and the total and completely creative and cute idea they are!! Wow - so excited about these!! I shared with my facebook friends - so excited about this!!! Wow! Super job and so cute!